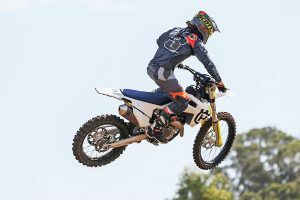 MotoOnline.com.au tests the 2019 Beta RR 200, 300, 350, 390, 430 and 480. Beta Motorcycles Australia recently invited MotoOnline.com.au to the launch of the 2019 Beta RR range in northern New South Wales, where we tested each model in the best trails and conditions you could ever hope to ride an enduro bike. 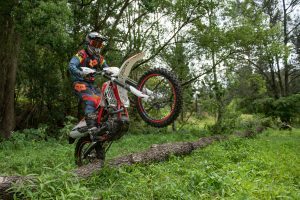 The Italian brand has been around for years and has a rich background in trials riding, as well as enduro, plus it’s had some major success in recent years on the world stage – even winning the 2018 EnduroGP World Championship with Steve Holcombe racing the RR 300. 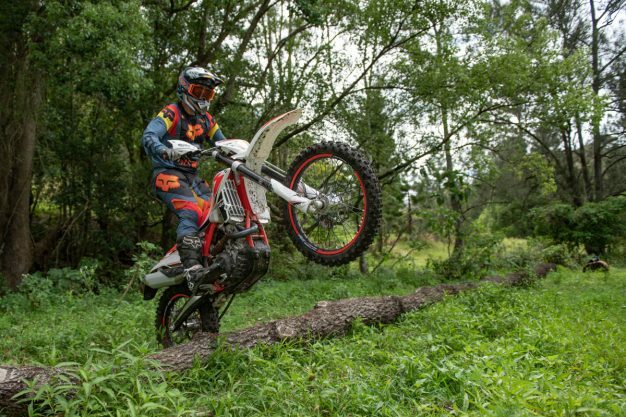 Beta offers a really wide range of two-stroke and four-stroke enduro bikes and, as a result, they basically have a bike for every person and preference of riding style. 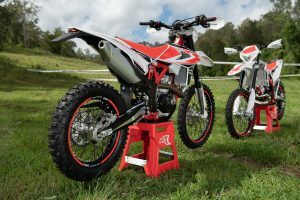 The two-stroke offering includes an RR 125 (not tested), 200, 250 (not tested) and 300, while the four-stroke range boasts the RR 350, 390, 430 and 480. 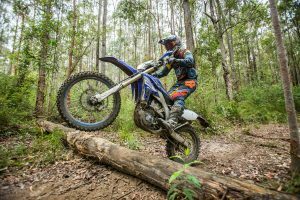 We were fortunate enough to ride the new range of Betas on some of the best single-trail located up in northern New South Wales. On offer were what seemed like endless amounts of steep up- and down-hills, off-camber turns, jumps and logs, creek crossings and plenty more. The track really gave us the opportunity to gauge each bike well and really find out where each bike’s specific nuances lay. 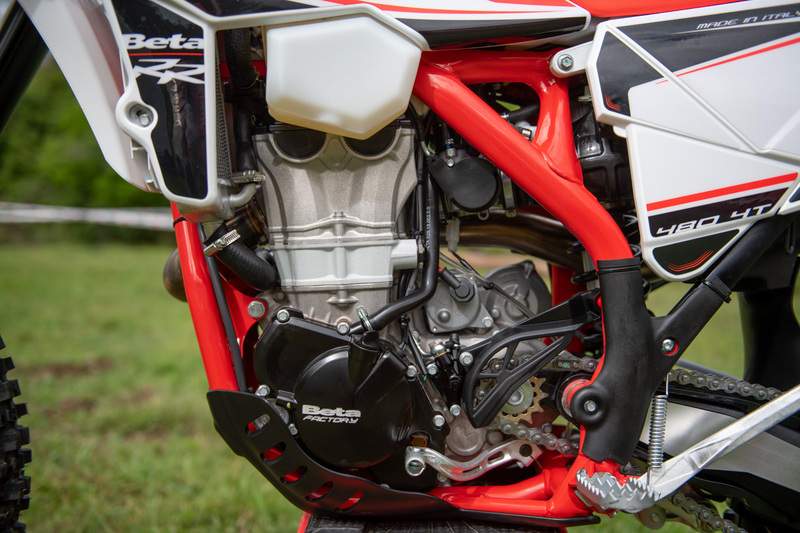 For 2019 Beta has made a heap of upgrades to both the two-stroke range and the four-stroke range, which you can read about in detail within the Bike article we recently posted. The two-strokes have had a new ECU installed, which has a more powerful spark at high revs and has improved combustion and engine performance. The clutch actuator has been improved with a lighter lever feel and is also a little more responsive. 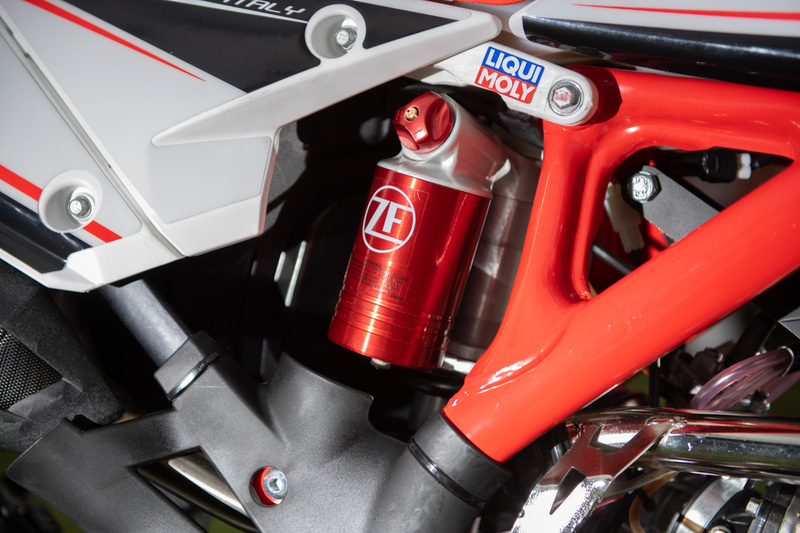 The new expansion chamber for both the 200cc and 300cc bikes has increased performance throughout the rev range and the RR 300 has new BPV exhaust valve opening adjustment, which has improved upon the linear power delivery. In addition to this, the RR 300 comes with a BPV centrifugal unit contrast springs kit to personalise the bike further depending on the rider’s needs and riding – the kit comes with lower spring rate to give better performance at mid-high revs and give the bike a more fuller and decisive power delivery. 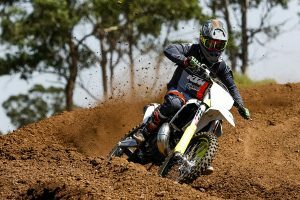 The four-strokes get some updates from the previous year as well with a new throttle control. Domino has improved the engine response with an updated throttle and new mapping for all engine sizes helps to further improve power delivery. 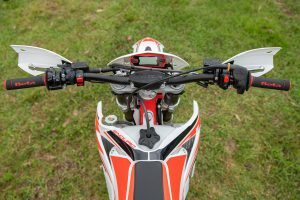 A new clutch actuator has also improved on the feel of the clutch with a more responsive feel and a softer feel on the four-strokes as well. Across the range, a new easily-adjustable ZF Sachs 48mm fork has been paired with a redesigned, lightweight ZF Sachs shock. Each of the models are sprinkled with quality componentry that most certainly make the Betas what they are, both visually and in terms of performance. 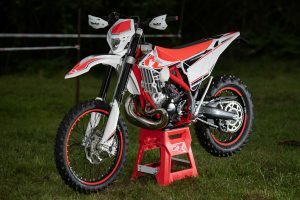 When I first saw the line-up of bikes Beta had on offer, I was left thinking why so many different capacities that are reasonably close to each other between the two- and four-strokes? Surely there isn’t much difference when they are so close like that… I had many questions and some concerns, but they were pleasantly answered. It’s been a while since I have seen a 200cc two-stroke and to ride a current year model and really get a good feel for the bike was a real treat. It feels so light and nimble, especially after stepping off of the RR 300. It’s surprising how much the motor pulls off the bottom and lugs around much better than I had imagined. 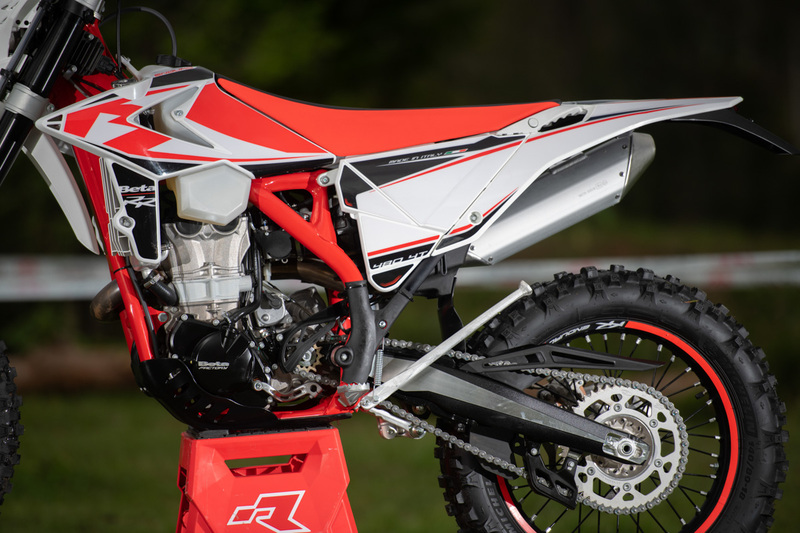 The engine, naturally, does like to rev more than the 300, but has enough to be ridden a gear higher than what a 125 would get away with. 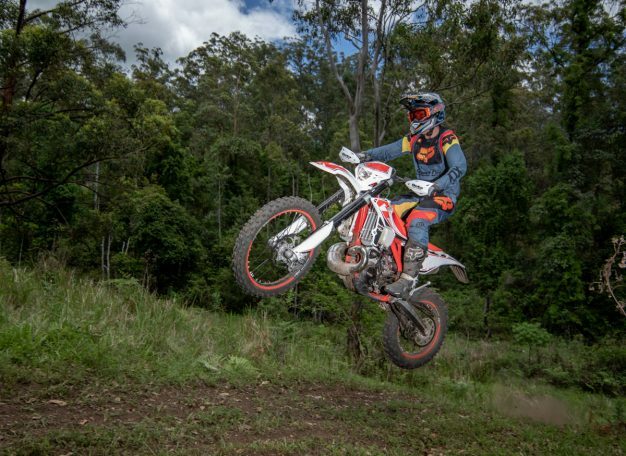 The Beta RR 200 is a really fun, playful bike that is ideal for most of Australian conditions, plus the ability to ride this bike for hours on end without getting overly tired is a true positive. The RR 300 is naturally a fast bike, as when you get on the gas, fences, trees, corners all start arriving quicker with less effort and more consequences. The bike makes an amazing amount of power down low and pulls all the way to the stoppers. The 300 really feels at home on the faster part of the trails where you can make use of the ample power. Not only is it awesome on the trails, but it handles well in the tighter trails. 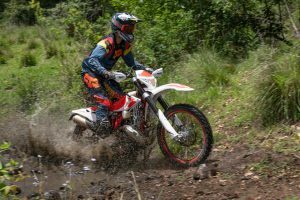 With all that power it does get tiring quicker since it is so abrupt with the power delivery – what you get with most 300 two-stroke bikes. If you are a fan of big-bore two-strokes, this is worth a look at – about $2000 cheaper than the most expensive 300 on the market – and after riding the Beta, shelling out those extra dollars isn’t a necessity if you’re in search of pure performance. The RR 300 is incredibly good to ride, handles great, has a well-performing engine and is finished really nicely as well. The Beta RR 350 is the smallest of the four-stroke range, which kind of seems strange in comparison to other brands out there that usually have the 250 as the entry into the four-stroke range. But the 350 fits well and, in the bush, the 250 has never been a favourite of mine anyway. Out of the entire range, the RR 350 is easily the most enjoyable bike to ride and it definitely doesn’t mind revving. 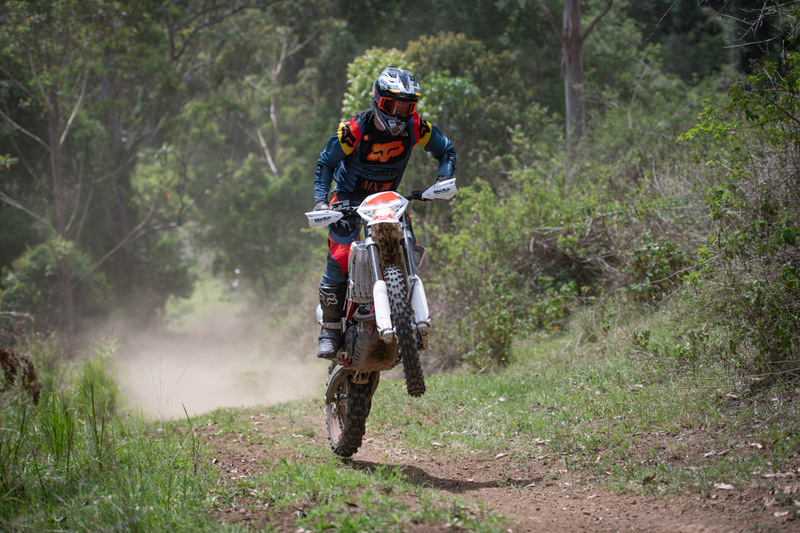 The 350 is the lightest at 109kg and has a responsive, high-revving engine that suits tighter conditions. 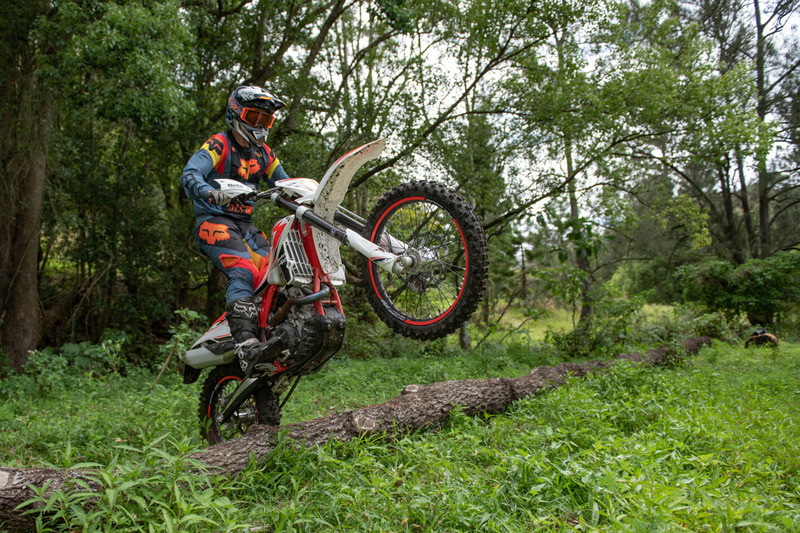 It’s no slouch on the open trail however, as the more you twist the throttle, the more it sings – albeit with a more controlled feel than the other larger-capacity four-strokes. 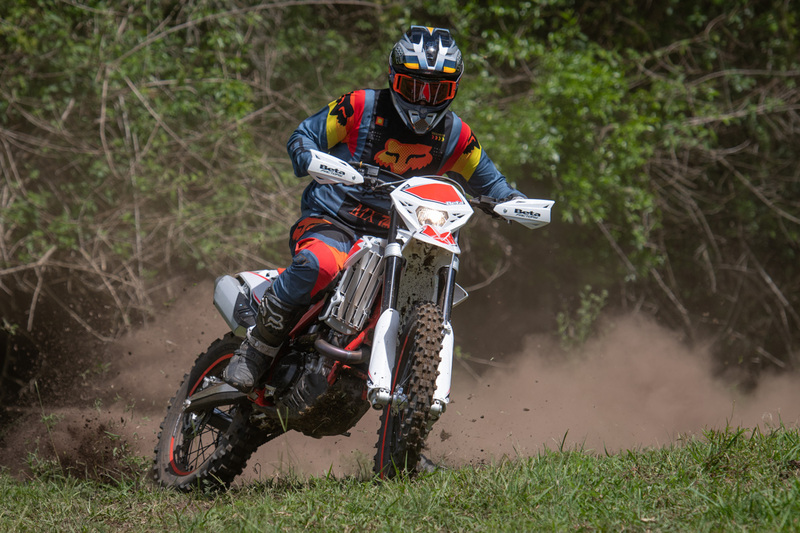 The RR 390 offers exceptional feedback as well, weighing in at the same weight as its smaller brother, but with a little bit more mumbo and a touch more torque down low. The ability to lug the RR 390 a bit more than the 350 results in a bike you can use the torque to your advantage, but it still reacts in a similar manner to the 350 in terms of delivery. I had more fun on the 390 just because it seemed to be a little easier to fix mistakes with a little more horsepower on tap, being just as light and features the same nimble, effortless cornering as well. Next, the RR 430 weighs in at 110kg so it’s not significantly heavier than the 350/390, but it does begin to feel more weighty and can be harder to pull up for corners. Short-shifting gears really comes into effect with the 430, although you can keep it a gear higher and use the engine’s torque to pull you out of turns. The RR 430 corners precisely, even if the inertia of the motor is more noticeable. The RR 480 has the largest displacement of the Beta range, again weighing in at 110kg, so there isn’t a big difference in weight at all. The 480 loves being ridden a gear up more often than not and using the torque of the engine is the way you get the best from it, that is for sure. We had a reasonably tight trail for what the RR 480 would feel more natural on, though it’s still comfortable between trees. You arrive a corners much quicker and with a bit more momentum generally on the RR 480, so you noticeably feel the bike is a little harder to manipulate into the slower bends, but on steep hill inclines and longer straights, the RR 480 ate them up. All of the bikes have a great finish all-round that provide well-fitting ergonomics, the suspension is at a competitive level and I didn’t really have any major difficulties in this regard, however a little bit of work to the fork and shock could somewhat improve the feeling for the rider as you tune them to your riding style and ability. 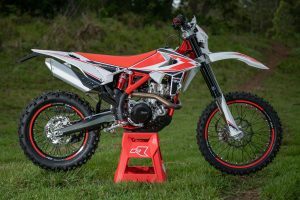 The forks are reasonably predictable and the shock also didn’t have any major surprises, but with more customised adjustments and time on-board, a more planted feeling could be achieved for rougher terrain. Of course, switching between each model on the one day during a launch does compromise the experience since there is only limited time to adapt to each, so that’s something to keep in mind. You will experience differing response between each model, despite each being relatively close in capacity, and if you’re uncertain what RR would be most suited to you, national demo Beta Days are currently taking place that allow you to sample them for yourself. 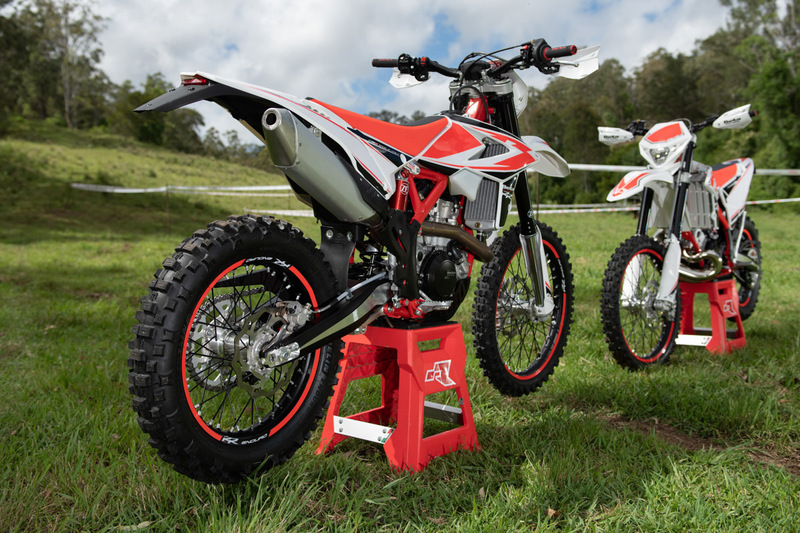 Agility, comfort and quality can’t be faulted on first impression, the world title-winning Betas are capable rides that will set you apart from the crowd. Beta has produced a bunch of solid options for consideration, since each one of them has a unique feel and would suit different styles of riding. The RR 200 stole the show for me as far as the two-stroke offerings are concerned. In recent years I have felt at home on 250 two-strokes, but the RR 200 is mega to ride and still has enough torque to get moving compared to 125s. 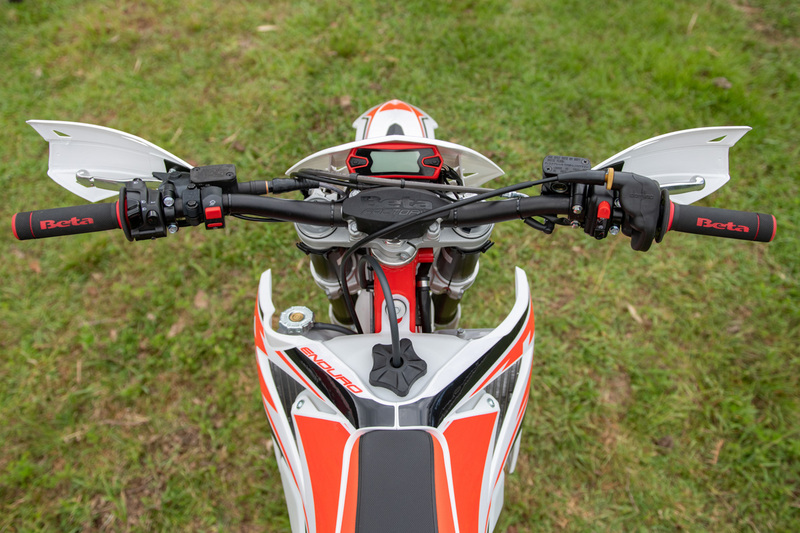 The RR 200 was a really enjoyable bike to ride – it’s light and nimble like a mountain bike in some ways. The Beta RR 300 is a beast of a machine and, generally, after a full day of riding any 300 I am fairly well-spent, but this is a package that you could certainly live with and make the most of. I still feel a little unsure as to what my actual preference was on the larger capacity four-stroke bikes, because – as Beta aimed for – they’re all individual in their performance and suit a range of different riding capabilities. 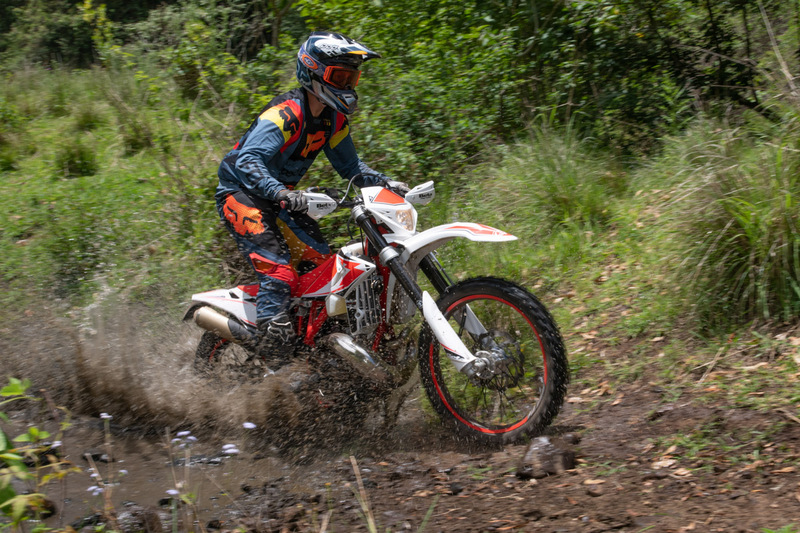 For me, reflecting on the launch, it was the 390 that I most enjoyed – especially on the test track that we were on. 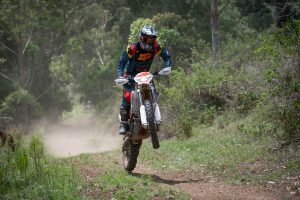 The larger bikes were harder to keep at bay on the steep down-hills, however having said that, the power that the RR 430 and RR 480 boast make for a significant help when it comes to inclines. When you look at the price comparison throughout the 2019 Beta RR range that’s now distributed through Lowry Australia, you have models that are right on the money when it comes to the finish, handling and performance.